Today is Blogging Againgst Disablism Day 2017. Please check out the main page to read other contributions or add yours to the archive. Last autumn, as has happened twice before in the twenty-one years since I got sick, my pain became suddenly and inexplicably worse. Since then, pain and pain management have become more dominant features of my day. Lately I've been thinking about the ways in which disablism makes life with chronic pain tougher than it needs to me. This is because it's not something that strangers can know. I'm married, I know these various people and am related to that bunch, but for all anyone else knows I can't stand a single one of them. This is something else a stranger cannot know. It's very unlikely that I would have enjoyed chronic pain, but suffering, and especially my identity as a sufferer, is a presumption. I have chronic pain. I am in pain right now but I am not suffering. Sometimes I suffer, but this is not a fundamental part of who I am. I am not a sufferer. I have become especially sensitive to this as pain has rendered the enjoyment of life a little more of a challenge. Several people, including myself, have been working very hard to ensure that I am not suffering most of the time. I just have pain. I am a person with chronic pain. Of course, I am extremely fortunate (and I'm going to mention this a lot). Chronic pain can be a thousand different things and I am very lucky with the type I have; my pain is sometimes severe, but when I hear about other people's pain in different parts of their bodies, I always imagine I have things a bit easier. Meanwhile, for many years, pain had a far more profound effect on my life because my circumstances were so much more difficult. This bad pain period has made me somewhat more isolated, but not as much as it once would have. It has not resulted in poor diet due to my inability to get food for myself. It does not make it harder to stay warm because I can afford to have the heating compensate for moving around less. It makes it harder to get clean and dressed, but I have help with that, various different ways of keeping clean and I am not going to be mocked if I look a little unkempt. I have even been offered carers to come in and help with getting dressed every day, but I don't really need or want that. As I pointed out to Social Services, I do have very nice pyjamas. For a long time, I was in no position to manage my pain, received very little help and any deterioration of my health and mobility was met with an increase of anger and violence towards me from the person I lived with at the time. All this is about circumstance, other people and culture rather than the pain itself, but it effected the way I framed my pain as a sort of punishment or my body's treachery. It helped me stay angry with my body and myself to some extent. There seemed no way of making things better. As with all aspects of impairment, we experience pain in a context and there's always a danger of mistaking that context – almost always the product of our disablist culture – for the effects of pain itself. In the management of chronic pain (or indeed, any health condition), there are two strategies which will do us no good whatsoever. The first is to pretend it's just not happening. The second is to focus on exactly how bad it is, the way pain penetrates our thoughts, everything it stops us doing and how much worse it could be, how unliveable, if we were somehow forced to push harder. Yet every year or two, the government sends me a form and asks me to do just that. Some of these forms are about my incapacity to perform full-time paid work. Pain contributes to this incapacity, but by far the biggest factors are fatigue and cognitive dysfunction. Often, I am simply not conscious for enough hours in a day to hold down a job. The government are far more interested in my pain. Pain is physical, pain is suffering and pain is legitimate. The fact that pain prevents me walking or self-propelling a wheelchair more than a few metres is the reason I am found incapable of working. Someone with agoraphobia who might collapse, hyperventilating before they made it more than a few metres from their front door would not pass this test and they can't even hope to raise money for a piece of kit like a powerchair which might (partially) mitigate that limitation. As the UK benefits system has become more ludicrous and cruel and disabled people have inevitably become more defensive, I see more people associating our political oppression with how much pain and suffering we experience. We're in agony - we shouldn't have to go through this! We're in agony - that's physical, that's suffering, that's legit! We shouldn't go through what we do – the scrutiny and doubt, the trick questions, the sense of having to justify our existence. But nobody should go through this. Nobody should enter into any process under the working assumption that they are trying to commit fraud. There is nothing special about physical pain. All games of legitimacy are disablist games which hurt other disabled people. But they can also effect our own relationship with pain and impairment. If we believe that any functional limitation we have – the inability to work, the need to use a wheelchair or any other kind of assistance – needs to be justified not just with difficulty but with suffering, it becomes extremely easy to start second-guessing ourselves. So we're in pain, but are we really in that much pain? Could we push ourselves a little harder? If we are enjoying life at all, does that mean we're not truly suffering and cannot ask for any accommodations? Which begs the question, did they actually have so very much to complain about? And if so, why celebrate the fact that a person was in so much distress and yet felt unable to talk about it with anyone? That sounds like a really sad situation, not an admirable quality. The pressure to stay quiet comes from the Tragedy or Charity Model of Disability. This is about showing courage or stoicism as a way of fighting against our supposed tragedy. A silent battle is particularly appealing to the dominant culture because it allows others to project whatever they need onto our story. They can have us suffering dreadfully, to be living symbols of their compassion towards those less fortunate than themselves, when of course our lives are more complicated than that. They can have us not wanting to cause a fuss, when perhaps really we're silenced by the fear of being seen to cause a fuss. True stoicism is, of course, about making the best of what you've got, focusing on the positive and putting the negative in perspective. Seneca, granddaddy of Stoicism, advocated thinking through the very worst things that could happen to us, partly so we realise they're not all that bad (depends on your imagination), partly so we can prepare ourselves for disaster rather than hopelessly worrying about it, and partly so we can appreciate it when these things do not transpire. Fingers crossed! True stoicism is not about gritting one's teeth and denying reality – on the contrary – but too often we describe a person as “stoic” when we mean “they've got it bad, but they don't complain”. And as well as silencing us, this can impair our access to effective pain management. I've heard folk being described as stoic when they won't visit the doctor, when they take risks with injuries, when they refuse disability paraphernalia. Or indeed, when they refuse to take the drugs they might benefit from. Thing is, some people take drugs that do them more harm than good, or are a waste of time and money. Some doctors prescribe drugs because they feel that's what patients want and it's much cheaper and less bothersome than other options. People – especially older disabled people – can end up getting prescription drugs on repeat for years without proper review. People are on drugs for conditions which could be greatly improved with things like psychotherapy, physiotherapy or nutritional therapy. And of course drug companies are all about making money. But none of this means that we get to pass judgement on a jam-packed dosset-box. The fact not every drug prescribed may be the best solution to that particular problem is the price we pay for the vast majority of drugs which either save or transform lives. The fact almost all drugs have side effects and increase long-term risks of medical complications is the price individuals pay for staying alive or having a much more manageable life, even if it turns out to be a little shorter. The fact that non-drug therapies are massively underused in medicine doesn't mean that these are things people should be (or even could be) engaging with instead. These decisions are personal and often medically complex. There's a stigma attached to pain medication. There are folk who refuse to take an aspirin when they have a headache and imagine that whatever noble principle they're exercising can and should be extended to others with different sorts of pain (which is anyone who doesn't have the exact same headache). I'm going to talk about opioids in a minute. However, by far the most stigmatised drugs are anti-depressants. own neurotransmitters, store-bought is fine"
I still see memes picturing a pile of multicoloured pills, contrasted with a beautiful scene of nature, stating that the former is garbage or poison or similar and the latter is a cure for depression. And again, it's not as if spending time outside in nature has not shown to be beneficial for people's mental health. Ditto meditation, spending time with animals or children, exercise, gardening, art and crafts, team sports, volunteering in projects that directly help other people and so forth. A more comprehensive health system would be able to point people with all kinds of chronic ill health, plus those at risk of future problems, towards some of these activities and it would reduce the number of drugs prescribed (although, of course, it would hardly cut costs). Even if all non-drug therapies and activities were made more accessible and affordable, people would still need drug treatments. It would be much better if we lived in a world where these drugs were more often only part of a treatment that involved all kinds of other therapeutic goodies. Apart from the should-be obvious facts that these pills and injections save our lives and make our lives more bearable, drug stigma and the idea that we should be doing other things, adds unnecessary pressure to people with chronic conditions. Almost anything disabled people do is often framed by others as “therapeutic” which is irritating enough (maybe even more so for disabled people who are in perfect health). Bring in this idea that nature walks or art classes could eliminate our need for the drugs we depend on and it becomes harder to access all manner of activities without feeling that we need to be looking for some kind of significant healt outcome. Exercise is probably the worst example of this. Exercise is very hard for a lot of people and downright scary for some – people with chronic pain are not alone in feeling some horror at the prospect of having to spend time focused on our bodies, the way they work and the way they feel. People with mobility impairments are forever ignored in calls to Take the stairs! or even Take the train! given the poor state of accessibility on public transport. In our culture, exercise is often presented as highly goal-oriented (usually around size), and is often proposed as cure-all/ punishment; Get your arse down the gym! we are commanded on the grounds of any one of many diagnoses associated with poor mobility. I exercise every day in such a way many people might fail to recognise as exercise. Even so, it takes a lot to overcome the sense that I should be building myself up to something, looking to increase what I can do, trying to lose weight (which, with the exercise I do, would take a very very long time) or indeed trying to reduce the drugs I'm taking. Sometimes my exercise might contribute to being able to drop a dose of one thing or another, but if I made that the point of exercise, I would meet with disappointment almost every day. In September, morphine moved from being a bad day drug to an everyday drug. Unlike all my other meds – including almost twenty years of different opioids - morphine is something people have heard of, it's something people associate with acute pain, but also abuse and addiction. It's a drug that comes up in song lyrics from time to time. Nobody ever sings about Movacol. I was reluctant to take morphine at all and once I was taking it regularly, I was nervous that my GP might be alarmed at how much I was taking. Friends and family have expressed particular concern about it, as if being on morphine makes my pain a serious matter (like it wasn't before?). More than once, my GP has assured me that I'm not that type of patient (the type whose drug use would concern her) and I realise that – as well as my GP being generally awesome - there's probably a large degree of privilege in coming across as sensible, responsible and self-aware enough to know if I was running into trouble. I'm also very conscious of my good fortune living in a wealthier part of the world, where seeing a doctor is free. My prescriptions have always either been completely free (they are currently) or have cost around £100 a year on a pre-paid card. I have never had to make decisions about drugs as a consumer. Nobody has ever tried to advertise prescription drugs to me. I'm aware that for friends in the US, anxiety over opioid addiction is making it very much more difficult for people to access appropriate pain control. As I understand it, a huge part of the problem there is around money; a minority of chronic pain patients sell prescription drugs on because being sick there is extraordinarily expensive. Some patients move onto heroin (entirely unregulated and unmonitored) because it is cheaper than getting a prescription. When both doctors and their prescriptions are expensive and patients are mistrusted, folks are forced to self-medicate. And if you can't afford regular daily painkillers – by far the best regime of managing chronic pain - it would be tempting to splash out on the occasional pain-free night when the cash is available. In such circumstances, even drugs of established provenance become extremely dangerous. The US saw 50,000 opioid-related poisoning deaths in 2015. The US population is only five times bigger than the UK, yet all our poisoning deaths, involving every kind of drug or substance, totaled under 3700. The danger of a drug – any drug - is highly contextual. Morphine is almost certainly less addictive than alcohol and yet we still cling onto the (disputed) idea that a glass of wine every day might be good for you. There's also a huge difference between chemical and psychological addiction. I am chemically addicted to dihydrocodeine, another opioid – its sustained release, so there's no buzz to be had, I just get really sick if I miss a dose. However, if I didn't need it any more, I would cut down in increments and suffer minimally. People do that all the time. Many people take strong opioids after injury or surgery for a few weeks or months, but others come off these drugs after a period of years; my Granny has weaned herself from morphine twice in the last decade. My father-in-law went practically cold turkey from morphine following an operation to fix his back. Psychological addiction is an illness in its own right. It doesn't start with a drug so much as the problems a person has which the drug (or gambling, shopping or any other compelling behaviour) allows some temporary escape from. Drugs, their effects and the cost of acquisition then play a role, escalating a significant problem to a cataclysmic problem as money, work, health and relationships fall under. Sudden withdrawal from opioids is horrible, and with emotional distress in the mix I have great sympathy for folk who feel utterly desperate. Having chronic pain doesn't magically protect a person from emotional pain or psychological addiction stemming from it. But this risk is not mitigated by suspicion and restriction of essential pain meds. The thing that makes my drug use particularly safe is my trust relationship with my doctors; I trust them and I feel trusted. If something did go wrong, I would be in the best possible position for getting appropriate help. I know way too many people who are not so fortunate. Most of us can deceive our brains at least a little bit about what's going on in our bodies. I think I'm more suggestible than most. I have this problem with empathy whereby I violently flinch and sometimes cry out when I witness realistic injuries on TV and in movies. If I watch or read something set in a cold climate, I start shivering and if conversation should turn to the subject of fleas, headlice or similar, I'm going to have to sit on my hands. Oddly enough, I do not catch yawning off other people despite living with fatigue. I think my yawn mechanism is broken, but I still have the power to make others yawn by talking or writing about it. Open wide! All this stuff doesn't mean that hunger, extremes of hot and cold, fatigue, itchiness, pain and the rest is all in our imagination, or that feeling any of these discomforts, we can trick our brains into imagining our bodies are comfortable. Discomfort indicates a problem, and evolution has rendered us incapable of ignoring it altogether. But psychology is a really useful tool in chronic pain management. Anything which can help distract from the pain, make the pain less frightening, less mysterious, or feel less like a punishment or a betrayal will make pain less painful and make us more capable of looking after ourselves. Unfortunately, many people with chronic pain have very good reasons to feel terrifically defensive about psychological influences on pain. The gentle tool of psychology has been broken in two, with one end carved into a very sharp point and nails hammered into the other. Most pain has a physical origin. It is possible for emotional distress to manifest in physical pain and of course, emotional distress often triggers bodily events (raised blood pressure in the head, muscle tension in the neck, reduced blood flow to the digestive system etc.) which can result in or contribute to pain. However, psychosomatic pain occurs only in people in considerable emotional distress and even when they know that's the nature of their pain, it cannot be reasoned away. of all impairment which uses mental health stigma to allow discrimination against as many disabled people as they can possibly cast some doubt upon. Gratefully, this stuff is much less common these days – I get the impression the generation of doctors who just couldn't cope with someone whose condition was not easily identified and swiftly cured are fast fading away. But what these folk experienced wasn't misdiagnosis – it was dismissal. They were rarely sent to any kind of mental health professional, despite their dramatic and (in psychiatric terms) atypical symptoms. What happens more often today is a little more subtle. My father-in-law was sent to a back pain support group before he had even received a diagnosis for his by-then chronic problem. This was – as was agreed among everyone present, some of whom were unable to stand up straight or walk – a holding pattern, a humiliatingly pointless exercise to slow down the flow of traffic to the various clinics these people needed to attend. Some folk would almost certainly drop out at this point – their condition might improve on its own or they might spend the rest of their life in unnecessary mysterious pain – but at least that would be a few off the waiting lists. The idea of an NHS-run chronic pain support group is great, but not before an attempt at diagnosis. I know others who have been sent to similar NHS-run support groups at the wrong time, when they've been seeking some other kind of help, and instead of thinking “Well, this group will help me gain knowledge and get perspective about my pain condition,” they have, quite reasonably, felt fobbed off, as if they were being asked to simply think positive thoughts to wish their pain away. Even though we don't always understand what is happening to us, we are experts in our own experience. To feel doubted or dismissed about such a profound experience as chronic pain is deeply traumatic. And if you begin to doubt your own chronic pain, therein lies a whole world of trouble; it is very much more difficult to look after your physical health, to not push yourself too hard, to medicate or sooth your body when things are bad. But most of all, of course, if you are conjuring up this kind of pain while feeling otherwise okay, what does that say about you? If you think you are in reasonable mental health, but are in fact in so much distress you are manifesting pain, how can you trust anything you think or feel? So when folk are defensive about the purely physical nature of their pain, this isn't pride, stubbornness or scientific ignorance – this stuff is borne out of trauma. And yet as I said before, all games of legitimacy are disablist games. The more we play into the idea of this fixed physical/ psychological binary, the more mental health stigma can be used to hurt everyone living with chronic subjective symptoms. This stuff also promotes a culture which makes it difficult for people with pain conditions to recognise and seek help for mental ill health, as well as denying us potential avenues of pain management. We need to be able to discover that fussing a dog, painting our nails or watching the falling blossom eases our pain without any sense that this throws the reality of our experience into doubt. The first image is the black and white Blogging Against Disablism Day logo. A banner across the top reads "Blogging Against Disablism" below which is a 5 x 4 grid. In each square is a stick person. The twenty stick people include one wheelchair-using stick person and one stick-person using a tool which might be interpreted as a white cane or walking cane. The second image is a cartoon pill pot containing green and white capsules which also appear to be tiny kittens. 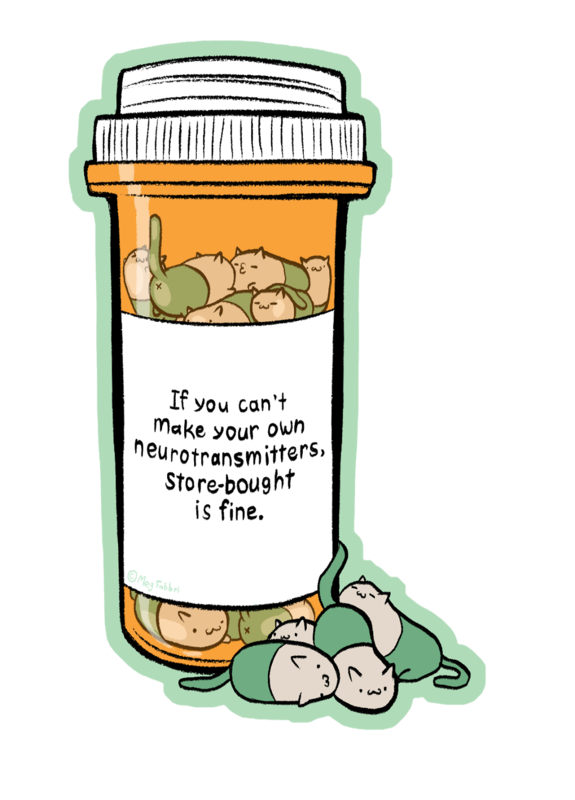 A label on the pot reads "If you can't make your won neurotransmitters, store-bought is fine." The third image is a photograph of a bright green sign with white writing on the mesh wall of what might be carpark. 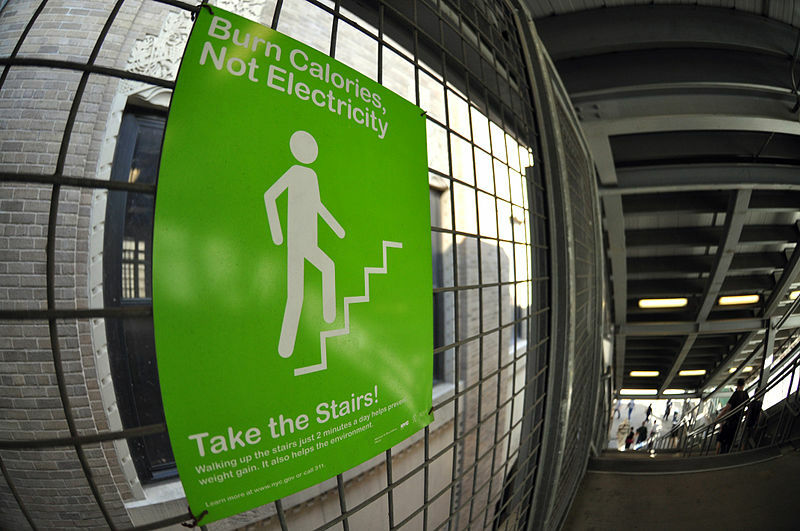 The sign features a stick person ascending the stairs above which reads "Burn calories, not electricity. Underheath the illustration it reads, "Take the stairs!" and in much smaller writing, "Walking up the stairs just two minutes a day helps prevent weight gain. It also helps the environment." This photograph was taken by Ludovic Bertron, was found on Wikimedia and is used under a Creative Commons license. 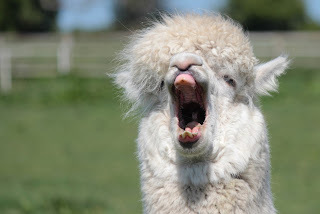 The forth image is a photograph portrait of a creamy-coloured alpaca, who is yawning and showing its impressive teeth. The background is rather blurred but suggests a field on a sunny day. This photoraph was taking by Rob Faulkner, was found on Flickr and is used under a Creative Commons license.